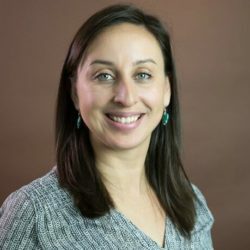 Brandie Buckless has 9 years of experience in community-based participatory research, evaluation, and program development and implementation specifically targeted for American Indian communities. She has expertise partnering with tribes and tribal programs to design, implement, and evaluate evidence-based cancer control initiatives. She has also worked directly with tribal, urban, and Indian Health Service clinics to improve health care delivery by coordinating systems change projects and facilitating linkages to the community. As a member of the Tribal ​Evaluation Institute project, Buckless provides technical assistance support to grantees of the Tribal Maternal, Infant, and Early Childhood Home Visiting Program for tracking and reporting on benchmarks, building continuous quality improvement processes, and conducting rigorous evaluation projects. She is a lead evaluation consultant for the Confederated Salish and Kootenai Tribal Education project and a liaison for the Multisite Implementation Evaluation of Tribal Home Visiting project. Previously, she served as project coordinator for the Evaluation of the Montana American Indian Tobacco Use Prevention Program​​. Buckless is Bitterroot Salish from the Confederated Salish and Kootenai Tribes of the Flathead Reservation in Montana. She received an M.P.H. in community health promotion with a health disparities concentration from the ​​University of Minnesota School of Public Health.